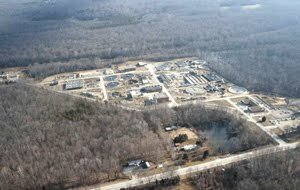 The Mattawoman Wastewater Treatment Plant located in the forested floodplain of Mattawoman Creek is also surrounded by wetlands. Note: the effluent is pumped 2.5 miles to the Potomac River. Growth enabled by the Mattawoman Waste Water Treatment Plant (WWTP) is a primary reason that Mattawoman Creek is showing signs of decline. The only solution is to revamp land-use policies. Motivated by a need to improve overall water quality and comply with regulations enforcing the Clean Water Act (CWA), the plant was greatly expanded in 1990. Ironically, however, the plant allowed developers in 1990 to manipulate Charles County government to declare most of the Mattawoman watershed a "development district" serviced by sewer. The rampant ensuing growth has taken Mattawoman from "near to ideal conditions" at the time of plant construction to the "tipping point ... where impairments to water quality become irreparable." While a poorly implemented sewer-system too often leaks raw sewage into Mattawoman, note that the WWTP's treated effluent is pumped to the Potomac River, not to Mattawoman Creek. The big problem is county-supported sprawl development that followed the plant. Sprawl has replaced forests--which purify stormwater--with roofs, roads, and parking lots--which pollute and rush stormwater into our streams. When the WWTP was constructed, it was recognized that the plant might induce growth damaging to Mattawoman. Charles County, the state of Maryland, and the Environmental Protection Agency signed a Memorandum of Understanding acknowledging that growth inducing impacts were given short shrift in the environmental review of the plant. The MOU also toothlessly acknowledged that "limitations on growth" and "land-use controls" were relevant to addressing the secondary impacts of the WWTP. During a review of the county-wide, comprehensive land-use plan on Feb. 8, 2016, the Director of Planning acknowledged that the plant probably should never have been located where it was. Yet Charles County is taking steps to enlarge the plant from a capacity of 20 million gallons per day to a whopping 50 million gallons per day! The plant itself is built next to Mattawoman Creek and is hemmed in by wetlands. Expanding its capacity almost surely means expanding its footprint into the wetlands. Will regulatory agencies have the will to prevent even more wetland filling, and even more secondary growth impacts that would spell the death of one the Chesapeake Bay's finest? Controlling the growth enabled by the sewage plant is the key to saving Mattawoman Creek. Fortunately, in July of 2016, a new comprehensive land-use plan was adopted by the Charles County Commissioners. It recommends zoning a new Watershed Conservation District for low density, just in time save the Mattawoman. The reduced growth should also make expansion of the plant unnecceary. But these positive steps will only occur only if zoning is implemented. The growth industry is working to stop that.